I'm still cooking every week, but lately I've fallen into the rut of making the same thing over and over because I haven't had the inclination or time to seek out new recipes to try. 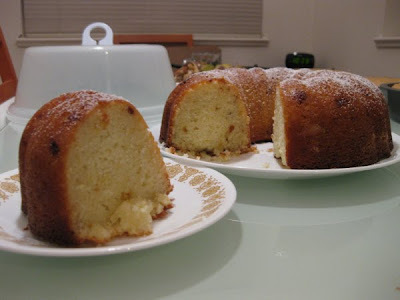 Two weekends ago, I tried something new and made a lemon ginger bundt cake according to a recipe from a back issue of Everyday Food magazine. 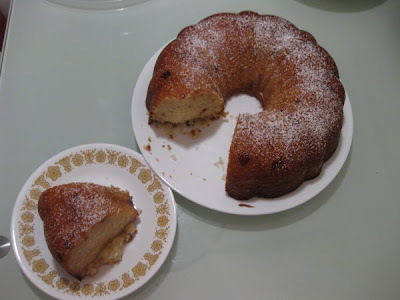 The cake met with positive reviews from my family and coworkers, enough so that I felt confident making it a second time as my contribution to a casual dinner get-together. Its buttery, dense texture goes well with tea or coffee, perhaps as part of brunch or an afternoon snack, but I don't think I'd make it for an after-dinner dessert again--too filling and heavy after a big meal. Here's the recipe if you want to try it out for yourself. Good luck! Preheat oven to 350 F. Butter and flour a standard 12-cup bundt pan. In a medium bowl, whisk together flour, lemon zest, ginger, baking soda, and salt; set aside. Bake until a toothpick inserted in center of cake comes out clean, 55 to 60 minutes. [My oven runs a bit cooler than most, so I left my cake in an extra 10+ minutes.] If cake browns too quickly, tent loosely with aluminum foil. Let cake cool in pan 30 minutes, then turn out onto a rack to cool completely. (To store, wrap cake in plastic, and keep at room temperature, up to 3 days.) Dust with confectioners' sugar before serving. omg lisa that looks so good. it's so old-school elegant! like soemthing my hubby's very formal granny would make and serve at afternoon tea. delish. YUM! Man, you're making me wish I had the patience to bake. Oh man, I wish I could eat that. I wonder if I could substitute the lemon juice for something... but then it wouldn't be a lemon bundt cake anymore would it? ~sigh~ I hate allergies. oh my god this looks AMAZING. i just got so hungry! miss.greentea, crystallized ginger is just candied ginger, I think. It's been preserved and coated in sugar; you can usually find it in the baking supplies aisle.